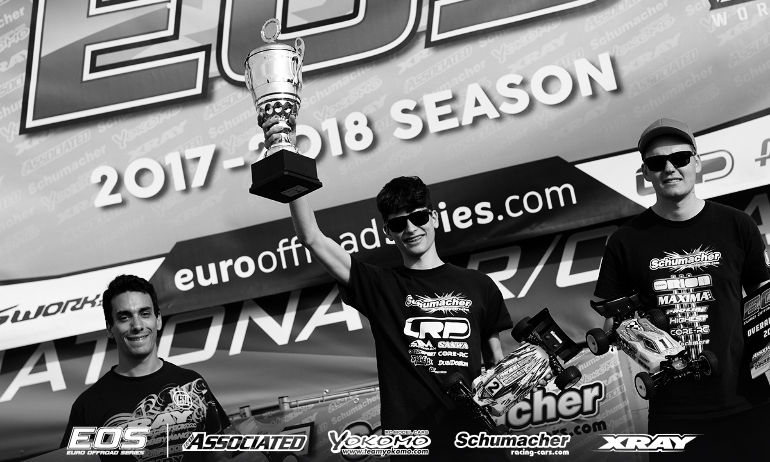 Michal Orlowski has pulled off the championship double at the Euro Offroad Series season finale in Germany. 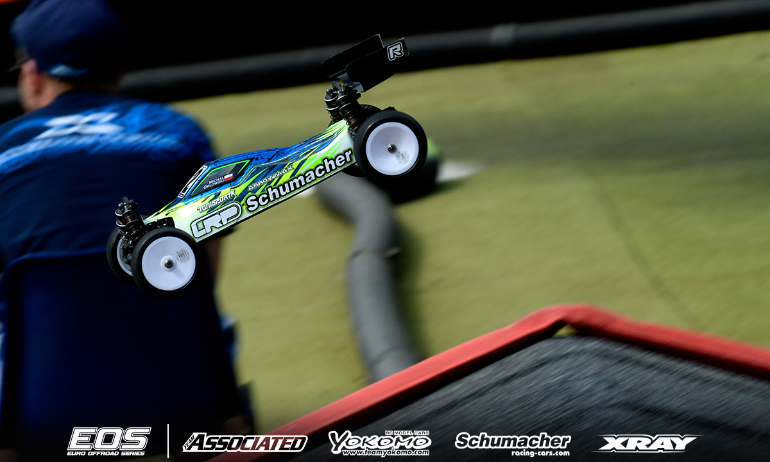 Have retained his 2WD title yesterday at Arena33, the Schumacher driver won the opening two A-Mains of 4WD to take both the first ever outdoor EOS encounter and the overall title. Only the third driver in the championship’s history to do the double, the Polish driver would definitely earn the victory. 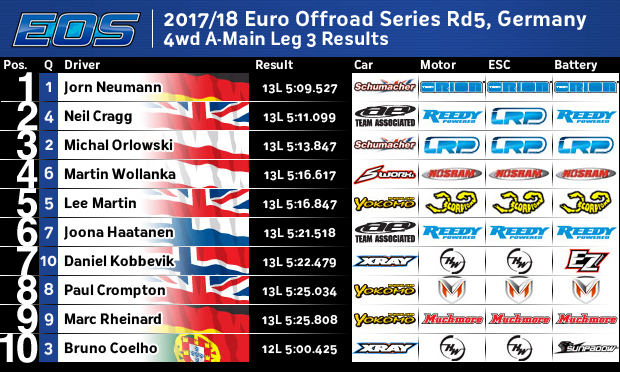 With himself and Top Qualifier Joern Neumann pulling clear of the field in A2, they would battle hard with the team-mates clearly given free reign to battle irrespective of the title being at stake for Orlowski. A mistake by Neumann which would collect Orlowski’s car would see the later go to the front with the German putting him under immense pressure over the final 2 laps with them drag racing one another to the line. With a 0.092 margin it was Orlowski who took it which together with his much easier A1 win took the vital overall win that was his only option in terms of taking the title from defending champion Bruno Coelho. 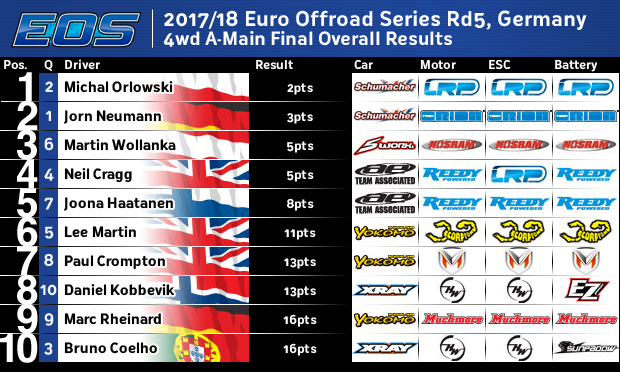 Both drivers would end the season on the same points but Orlowski’s win gave him the tiebreaker – 3 wins over Coelho’s 2. ‘I have been volunteer marshalling all weekend, this is the karma’, was Orlowski’s reaction to his second title in 2 days. The 16-year-old continued, ‘I cant thank enough everyone around me. Trish, Jurgen, my dad, they have been with me every EOS race and I wouldn’t be were I am now without them’. With today’s race victory his 4th in 4WD, he said, ‘I had a good night sleep for today. Qualifying went well. 2nd is good for me and then myself and Joern had a great fight. I was lucky in the first one but in the second one we broke away. Joern was pushing hard after his mistake and I could feel the pressure for sure’. 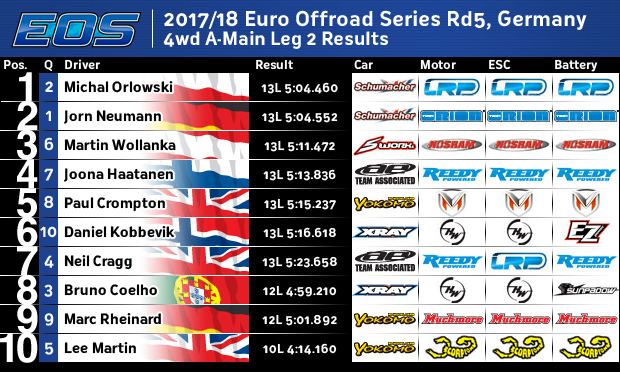 With Neumann only joining the team from the second round of the EOS and getting his first win for more than 3-years in 2WD yesterday, long time Schumacher driver Orlowski said, ‘Joern was very quick here and I’m looking forward to the competition. We showed here our car is really good and I think there will be even more competition next season between us’. Not even making the podium on the championship’s first astro turf event, Coelho believes they lacked preparation for the race. He said, ‘for sure I’m not happy with the result but I can’t ask for more. I couldn’t practice for the race because of my schedule. I had no time other than 2-days before in Vienna. I also missed one race because of the TITC’. Having been the first driver ever to hold an ETS, ENS and EOS title all at the same time, he continued, ‘this one is already done so we need to focus for next season. One year ago and even the first race of the season our car was so much quicker but the other brands caught us so we need to improve. Qualifying third, he said, ‘In qualifying I was lucky, the traction was different but in the finals I need to force a lot to follow them and which I can’t do without mistakes’. 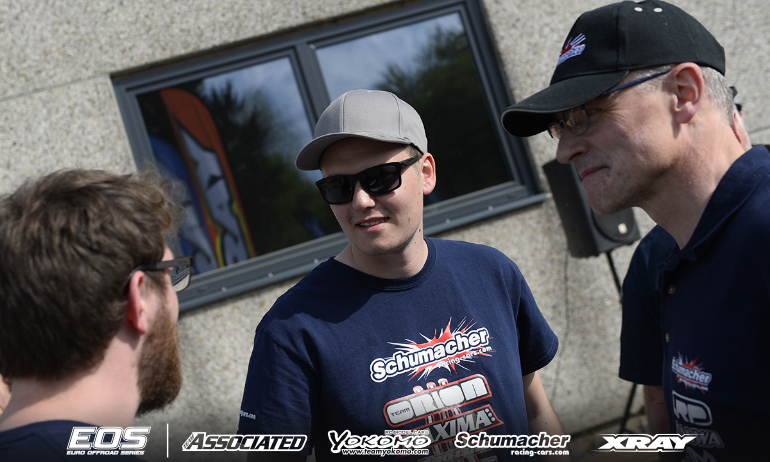 Winner of A3 to make it a 1-2 for Schumacher at Arena33, Neumann summed up the result as, ‘Pretty good, a 1-2 for Schumacher in the race and 1-3 in the championship’. Having had mistakes in A1 & 2, both of which cost him the lead, he said, ‘In the last main I drove at only 85% be be safe and make no mistakes’. Summing up what was effectively on a part season as he didn’t attend Round 1 and then only got hold of his new Schumacher cars in January, he said, ‘this season I didn’t do the first race and then have all new cars I need time to tune them to my liking and we got there this weekend. You can see the improvements each race. 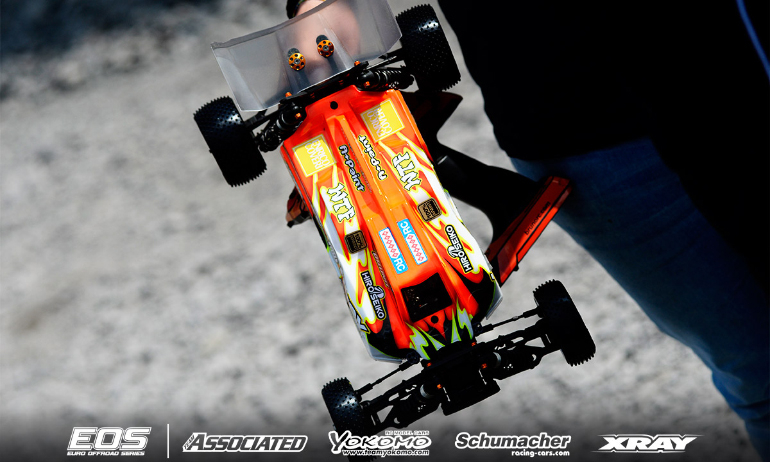 At the Hudy Arena I got a podium, then in Wels I got second and here I got the TQ and second. I think next season both me and Michal will be very strong’. Completing the podium and another driver to join a new manufacturer in 2018, Martin Wollanka claimed Sworkz’ first ever EOS podium at only his second attempt. 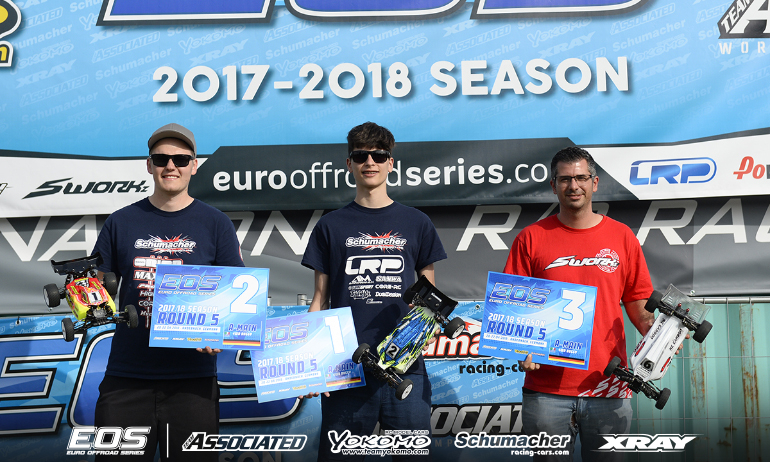 Debuting for the team at previous round in Austria, where he finished 5th, the Austrian was strong throughout the weekend in Andernach. Opening with a 3rd in A1 he would back that up with second in A2. Fourth in A3, he would tie on points with Team Associated’s Neil Cragg who took 2nd in A3 but with his A1 time 6/10th quicker he denied the 2WD Vice Champion his first EOS podium finish in 4WD. ‘Super happy’ with his podium finish, Wollanka, who is currently running a prototype buggy said he is looking forward to a full season of EOS with the production car’. 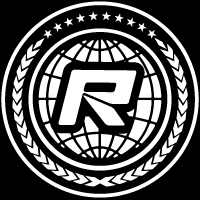 View the event image gallery here.